As the saying goes, it’s as American as apple pie, baseball, and phlox. Yes, phlox. Few plants are dispersed so widely across North America as phlox, yet only one phlox species occurs anywhere else. Like many New World plants, phlox was among the early treasures sent to Europe from America. Pennsylvanian horticulturalist John Bartram sent garden phlox (Phlox paniculata) plants collected near the Brandywine River to England in 1732. This wonderful perennial was the first of many phlox species to be welcomed and much-hybridized in England and Europe. 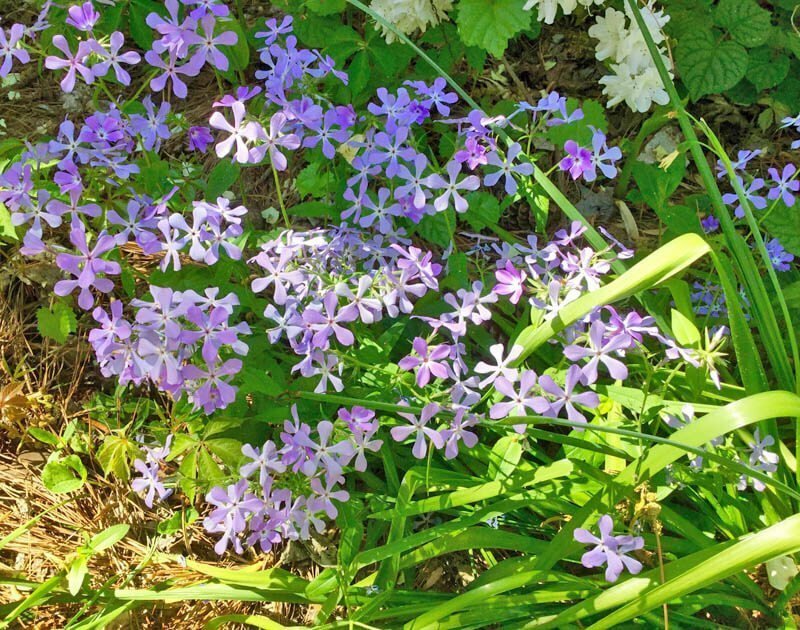 Many 19th century Americans sought out Phlox for their gardens never knowing the European cultivars were descended from our own native wildflowers. The phlox of my eastern North Carolina childhood was one of those repatriates, Drummond phlox (Phlox drummondii). This Texas wildflower, collected and sent to Europe in 1835, returned to America as a wildly popular bedding plant before the end of the century. The bright little annual soon escaped gardens, reseeded, and naturalized across the southeastern United States. 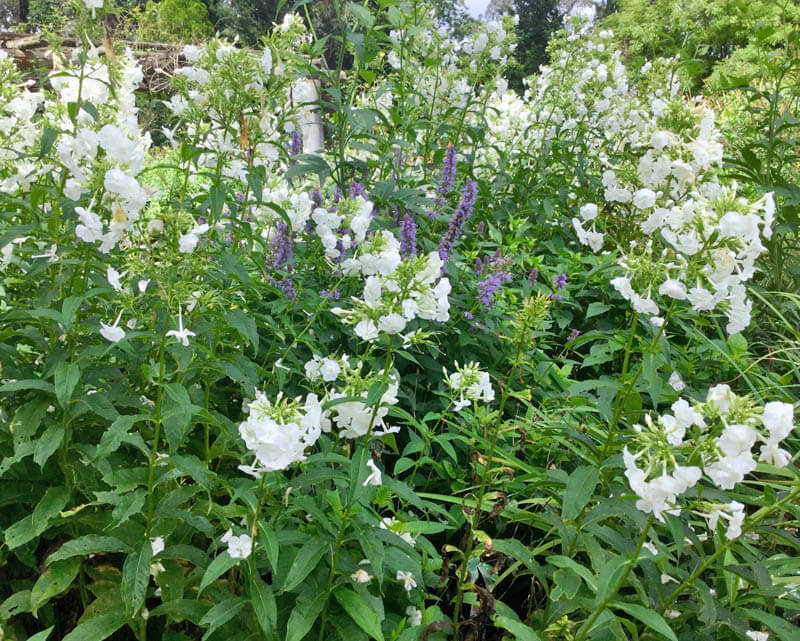 Phlox means “flame” and the name seemed apt in the 1950s and 1960s when yards and roadsides in eastern North Carolina blazed with a glory of pink, purple, and white. Like most country lawns, ours was a “mow what grows” affair. I looked forward to spring when we enjoyed several weeks of riotous color and baby powder fragrance before my father began mowing for the season. Few patches of annual phlox still persist on eastern Carolina roadsides, but seeds are available and thrive when planted in sunny spots with loose soil. 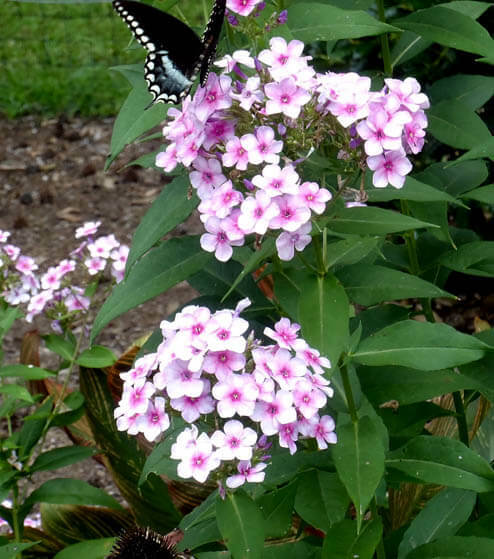 North Carolina is also home to a number of perennial phlox species. With a bit of planning and attention to site, you can add a little fire to every season in your garden. Creeping phlox (Phlox subulata), also known as thrift or moss pink, grows wild on rocky slopes and dry hillsides where it forms a low-growing, evergreen groundcover. Flowering can begin as early as late February and continues through April. Rarely needing additional water once established and with no need for rich soil, creeping phlox does want good drainage, which can be achieved by amending soil with organic material or planting on a slope. It is suitable for full sun, but also performs well in part sun here in the Triangle. Creeping phlox is so undemanding that it can be inter-planted in lawns for an early show. About three weeks after the bloom is spent, mowing can begin and continue for the rest of the season. Of course those wishing to try this “mow what grows” variation will have to abstain from broad-leaf weed killers. When grown as a more traditional groundcover, a bit of shearing after flowering will keep the planting tidy all summer. By mid- to late-March and usually continuing throughout April, our state’s moist woodlands are graced by the beauty of woodland phlox (Phlox divaricata) also known as wild sweet Williams. While best situated in deciduous shade, woodland phlox also performs well in sites with morning sun and afternoon shade. No butterfly garden would be complete without the belle of the ball, garden phlox (P. paniculata, P. maculata, P. glaberrima). Also known as tall phlox, garden phlox ranges in height from 1-½ to 5 feet. Bloom time begins mid-summer and, if plants are cut back after flowering, can continue into fall. 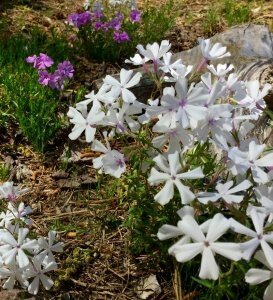 Commonly seen along roadsides in the North Carolina mountains, garden phlox thrives in moist sites with full sun, but also performs well in part sun where it may require less water. Garden phlox grown in less than full sun can be cut back in late spring to keep it from becoming too tall and leggy. In my shady garden, I cut tall garden phlox to half its height around Mother’s Day. Although flowering is somewhat delayed, I enjoy fuller blooms and no staking. Garden phlox can succumb to mildew, and even mildew-resistant varieties perform best with adequate air circulation. Garden phlox fanciers will want to make the acquaintance of Phlox ‘Minnie Pearl.’ Discovered in Mississippi, ‘Minnie Pearl’ is believed to be a naturally occurring cross of P. maculata and P. glaberrima. It features pearly white flowers beginning in late spring and glossy, mildew-resistant foliage. ‘Minnie Pearl’ will repeat bloom if cut back after flowering, and it leaves an evergreen rosette thorough winter. Could it be, a single phlox for all seasons? Featured image – Phlox paniculata by Dale Batchelor.